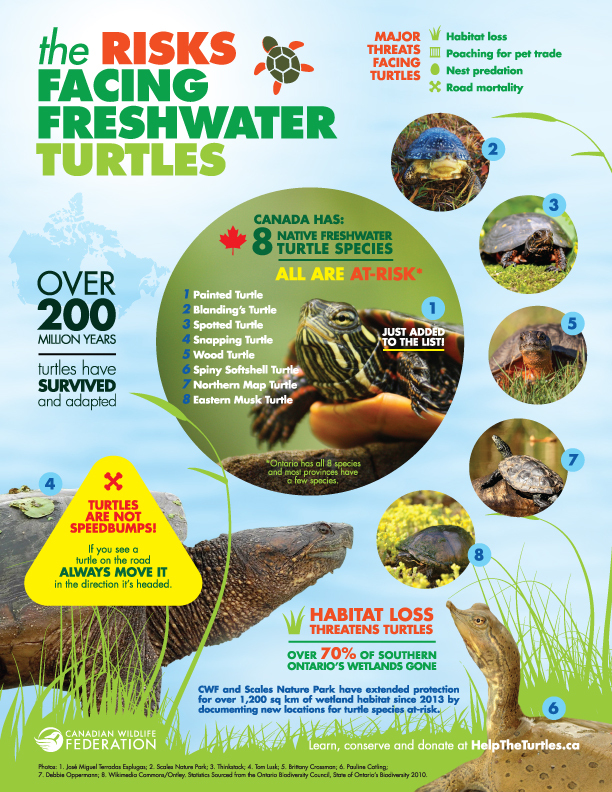 The Canadian Wildlife Federation continues to work with regional partners, community groups, lake associations and individuals to reduce risks to turtles. We continue to carry out on the ground surveys to document at-risk turtle locations and HELP PROTECT their habitat. We have also undertaken an analysis of hotspots where turtles are more susceptible to being hit on the road. Finally, we continue to work with partners to outfit turtles with radio transmitters to track movement, habitat use, nesting sites and overwintering sites. Support Freshwater Turtles with Oat & Mill Frozen Dessert! When you purchase a pint of "Turtle Crossing", a percentage of the proceeds will support CWF's turtle conservation programs. Visit OatandMill.com to find a retailer near you. “All 8 freshwater turtle species found in Canada are listed as Species at Risk. " The numbers are devastating. But the Canadian Wildlife Federation believes that we can help conservation efforts for these at-risk species. We are working with partners and landowners, the government and YOU to move forward in helping freshwater turtles in Canada. LIVE! Rescued Snapping Turtle Eggs Hatching! Yes, I’d like to receive communications from the Canadian Wildlife Federation. 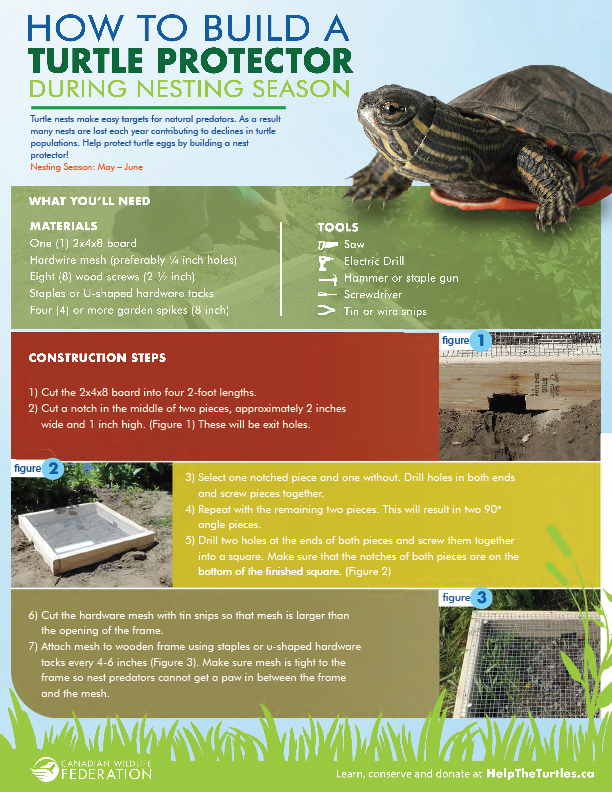 Help female turtles by building a nest protector. DESCRIPTION: The Eastern Musk Turtle is easily recognized by its narrow, high arched shell. This turtle has a dull black brown body except for two distinctive yellow stripes found on the side of the head. When disturbed, the turtle lets off a musky, skunk-like scent. Adult Size: 9-12 cm. HABITAT: Eastern Musk Turtles live in shallow lakes, rivers, marshes and ponds with soft muddy bottoms and slow moving currents. DESCRIPTION: The Northern Map Turtle has an upper shell with a ridge or keel running down its centre and has a serrated edge at the base of its tail. The shell, head and limbs are adorned with a series of yellow lines that resemble the lines on a topographical map. Adult Size: 9-16 cm for males, 18-27 cm for females. HABITAT:Northern Map Turtles live in large lakes and rivers with slow moving currents, an abundance of aquatic vegetation and muddy bottoms. 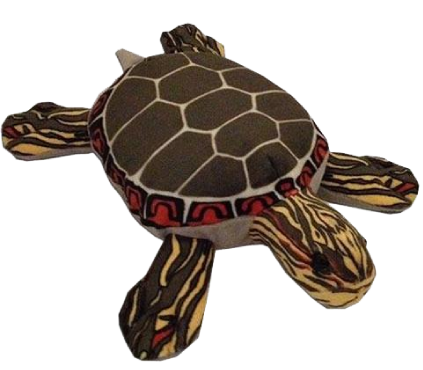 DESCRIPTION: The Painted Turtle has a smooth dark shell with red blotching/barring along the outside edge. Its dark skin is adorned with yellow and red strips, most prominently along its head and neck. Adult Size: 11-26 cm. HABITAT: Painted Turtles live in shallow lakes, ponds, creeks, and wetlands, preferring waterbodies with soft muddy bottoms and an abundance of aquatic vegetation. DESCRIPTION: The upper shell and top of the Spotted Turtle’s head is covered with small yellow or orange spots. Its limbs and tail are black with varying amounts of yellow or orange. Adult Size: 9-14 cm. HABITAT: These turtles can be found in shallow, slow-moving ponds, marshes, swamps, bogs, ditches, vernal pools and wet meadows. DESCRIPTION: The Wood Turtle has raised irregular pyramidal shapes with visible concentric growth rings on their upper shell that resembles wood. There is distinct orange colouring on its neck and forelegs. Adult Size: 14-23 cm. HABITAT: Wood Turtles live in meandering streams and rivers with sandy/gravelly bottoms and the surrounding shoreline habitat generally within 300 metres of water. DESCRIPTION: The Snapping Turtle is the largest freshwater turtle in Canada. It is distinguished by its large head, hooked upper jaw, and long tail. Adult Size: 20-49 cm. HABITAT: Snapping Turtles live in shallow, slow moving lakes, rivers, ponds, and wetlands with dense vegetation and a muddy bottom. DESCRIPTION: The Spiny Softshell Turtle has a flat leathery shell ranging from brown to green to beige. It also has a long tubular nose. Adult Size: 12-24 cm for males, 18-43 cm for females. HABITAT: Spiny Softshell Turtles live in rivers or lakes with abundant aquatic vegetation and sandy shorelines. They can be found basking along riverbanks or on rocks. DESCRIPTION: The Red-eared Slider has a slight ridge running down the centre of its upper shell. There is usually a long red blotch on either side of its head, behind the eyes. Adult Size: 23-33 cm. HABITAT: Red-eared Sliders have been introduced to urban and suburban ponds, lakes, rivers and wetlands. DESCRIPTION: The Blanding’s Turtle has a highly domed, smooth, dark coloured upper shell with light coloured flecks. It also has a bright yellow chin and neck. Adult Size: 12-27 cm. HABITAT: Blanding’s Turtles live in nutrient rich lakes, shallow streams, marshes and swamps with dense vegetation. You’re driving down a back-country road and suddenly there’s a turtle on the road. What do you do? Read on to learn how to move a turtle across the road. It is important to know when a turtle needs help and when it does not. Learn more about how to move a turtle safely across the road. Sometimes yard or excavation work can uncover a nest of turtle eggs, such as in a compost pile. If you expose eggs, cover them back up with the nesting material. If the eggs are moved, they may not survive. Most turtle hatchlings emerge from nests in late summer or early fall and head for water. Hatchlings are about the size of a loonie and are completely independent. If you find an uninjured hatchling, let it be, as it will find its way to the closest water body. If you find an uninjured turtle on the road, you can help it across by moving it in the direction it is headed. If you have found an injured turtle, take these steps until you contact a wildlife rehabilitator for advice. Aside from Snapping Turtles, most turtle species can be carefully picked up with two hands at the sides of their shell. Place the turtle on a damp towel in a well ventilated plastic bin with a secure lid. Do not provide any food or water. Keep the container in a dark, quiet place away from people and pets. Do not provide any additional heat source for the turtle. Contact a rehab centre for advice as soon as possible. In the Muskoka/Lake Simcoe Region: Call the START Hotline 705-955-4284. Across Canada: Report turtle activity on iNaturalist.ca in the “Help The Turtles” project. Your sightings (especially near highways) will help us determine active freshwater turtle areas, critical to CWF’s ongoing conservation efforts. Public engagement and awareness is essential in turtle conservation. Talk to your neighbours and the local community to bolster support for turtle conservation which can lead to direct actions to safeguard turtles. You can be a turtle ambassador and let your councilors know about areas of high turtle mortality so fencing and/or a turtle crossing sign can be installed. Encourage the rest of your community to do the same. Drive safely and slow down when approaching areas where wetlands are close to the road. This will give you enough time to safely swerve around a turtle.